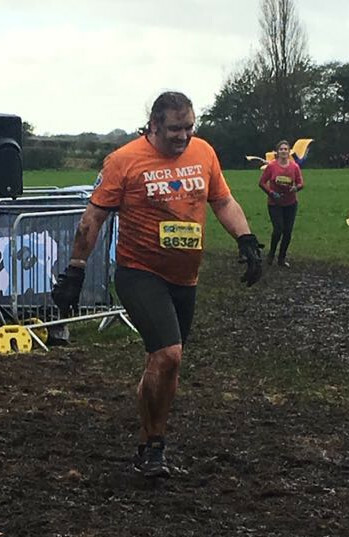 Two weeks ago saw me completing the last of my Charity Challenges this year - a 5k Rough inyRunner; basically a 5k course with large Total Wipeout-style obstacles. For those who are coming to this later even than me, two weeks ago was Storm Brian. Yep. 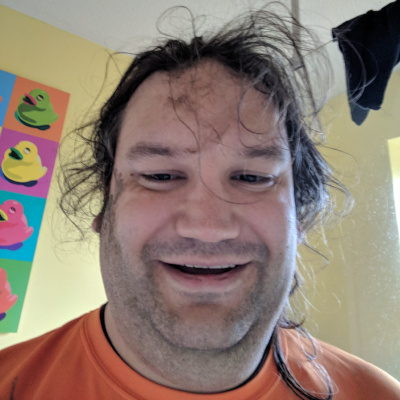 I ran a 5k obstacle course the day after a named storm. Hi Brian. Thankfully we ran it on the Sunday and not the day of the storm itself, but it was the muddy aftereffects we had to deal with. It was cold, it was windy, there was rain and, mostly, it was muddy. So very very muddy. There was a bunch of us from work: Paul and Glenda (who have been with me throughout all these challenges), Meg and Cathy (who talked us into this particular adventure). Also, offering very important support, was Meg's daughter. So I'll blame my restricted running on the mud and not on general levels of unfitness and failure to get past week 3 of the Couch to 5k programme. I did run at some points, honest. But mostly I walked. The event started off with registration and briefing before a warm up. We had to sit in the mud... and do sit ups in the mud. In the mud... Oh well, it was only the start of getting muddy, and at least the rain had stopped. Obstacles included large hurdles to pull yourself over, mud, large obstacles to pull yourself over, mud, large hurdles to pull yourself over, a runway in the classic It's a Knockout style (complete with people trying to block your way), more mud, the monkey bars of doom (which I chickened out of), the Zip Wire (which I didn't chicken out of), a water slide (yep, if you weren't already drenched you were after this), a muddy woodland path which wasn't the best without the added water, an unnecessary cargo net crawl (it was there but I don't think it was an actual obstacle), fighting through a load of big balls, dodging windmill arms on a balance beam (more on that later), dodging swinging arms on stepping stones and the Travelator. And no-one to take photos. This will be my last blog post reminding you of the fact that you can still help me raise money for Albert Kennedy Trust and Medecins Sans Frontieres. I have so far raised £1017.40 in "real money", or £1,220.50 when Gift Aid is included. I am so happy with this, but I will be even happier with more. The page is open for donations through to 1st December, so if you haven't donated previously, please do - you have less than a month. And now, I think we should all join in with a chorus of Mud! Mud! Glorious Mud!